An ‘Obsidian’ jewel in the yard of Step 1 Travel of Horncastle, Lincolnshire is it’s new Mercedes-Benz Sprinter 516 Bluetec mini-coach, converted by Excel Conversions. 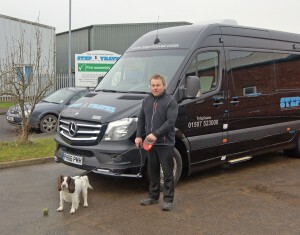 Chris Peat met with Step 1 Travel proprietor Philip Heath to inspect this new vehicle. He also took the opportunity to see some more of Phil’s fleet and talk to him about his time in the industry. 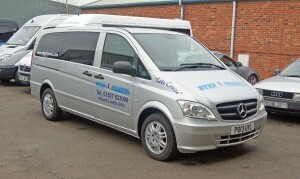 Phil chose the base vehicle for this conversion from Northside of Immingham, the Mercedes-Benz dealership. 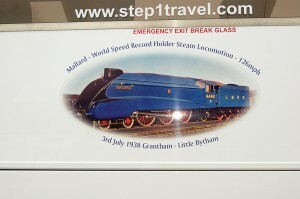 He then engaged Peter Vernon from Excel Conversions of Doncaster to adapt it into a mini-coach. 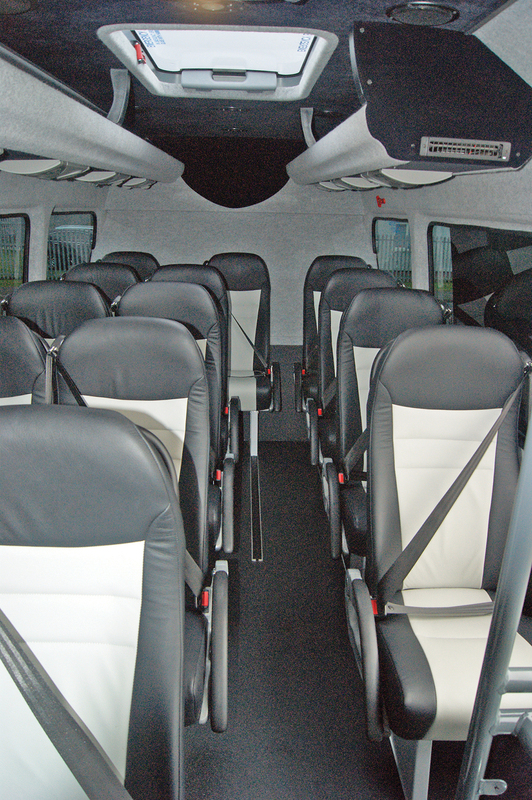 The vehicle has 15 Kiel leather passenger seats, full air conditioning, a reversing camera. a manually operated side step, USB sockets for charging passengers’ devices, O-Trim wheel trims and cup holders. It is driven through a 7G Tronic gearbox. 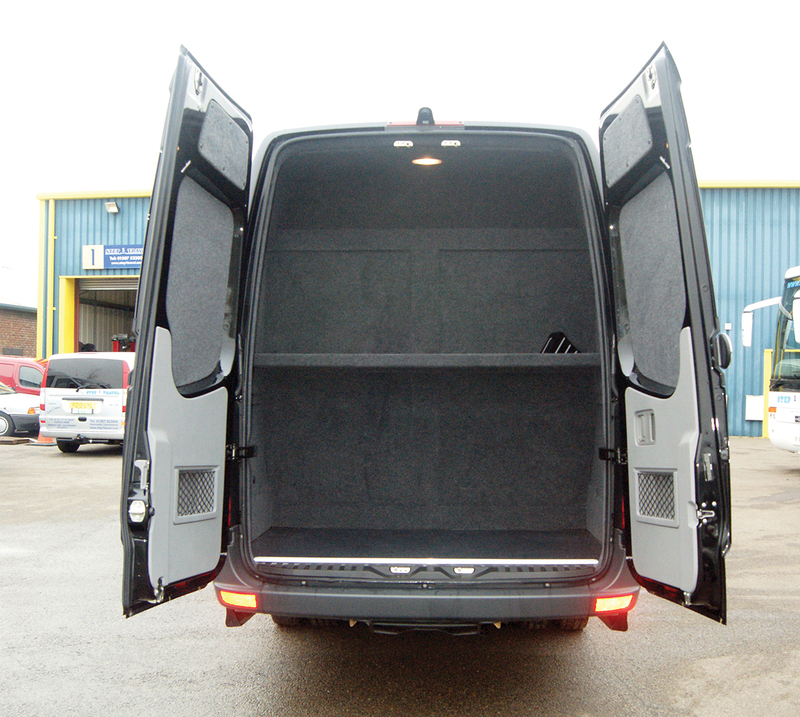 A feature Phil likes in particular is its darkened glass, which he believes is fitting considering the vehicle’s use on corporate work. 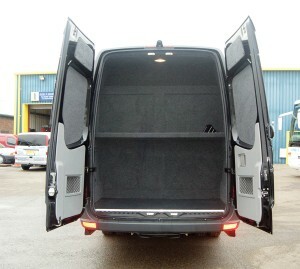 Also suiting this class of service, it has an electrically operated side sliding door to the nearside for passenger entry, which is made to look all the more impressive with blue edge lighting. 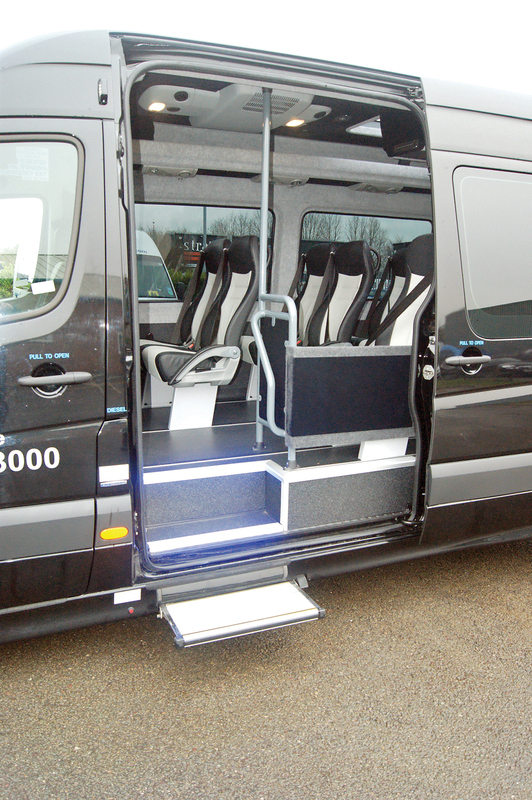 The entrance to the Sprinter features LED step lighting and an electric door. Ample luggage capacity is offered in the new vehicle. 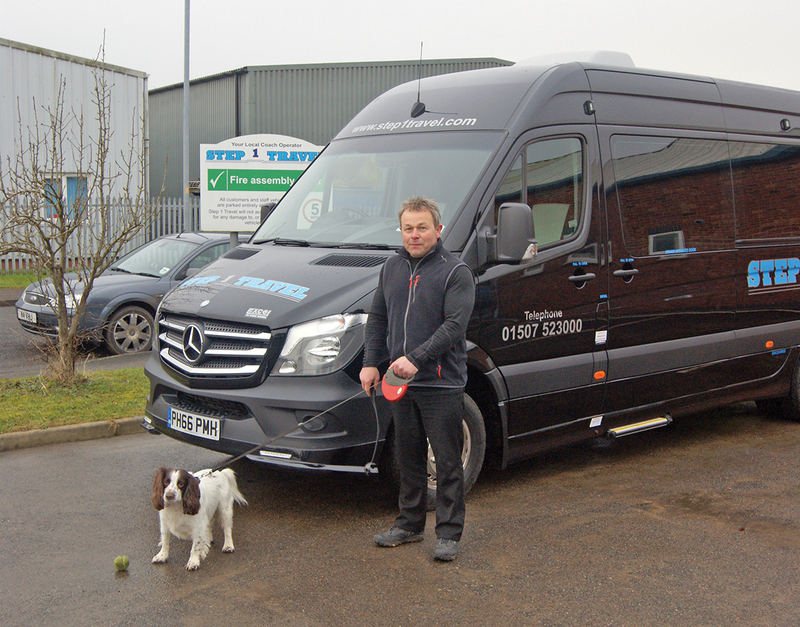 At the same time as Excel were converting ‘Bandit’ the black Sprinter, Phil commissioned Peter at Excel to convert another Mercedes Sprinter which was already in the Step 1 Travel fleet as an eight seater which was coming to the end of it’s private hire life. The vehicle has been changed to a camper for corporate hospitality use. The vehicle was completed with a kitchen, shower area, storage cupboards and a sleeping/seating area. 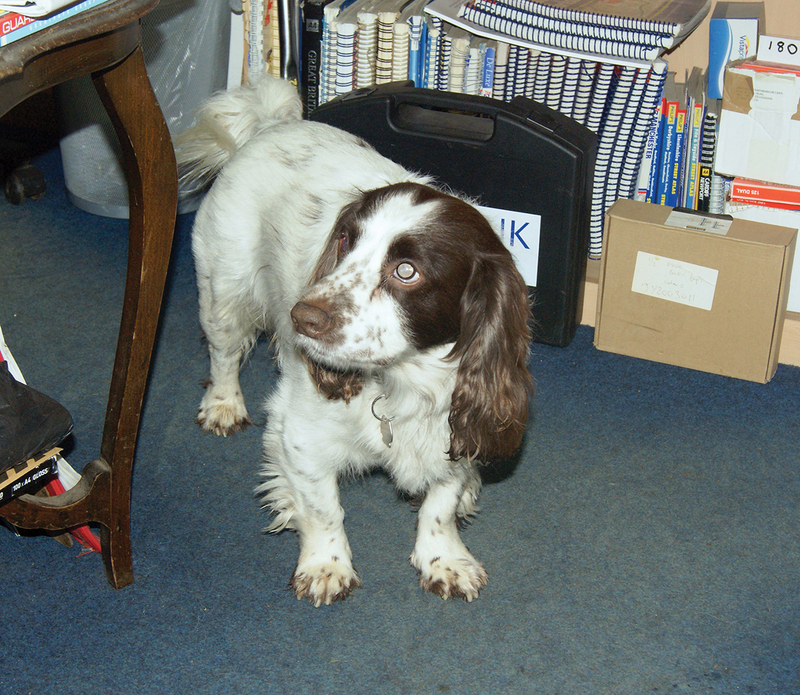 Phil and his partner Denise hope to use the vehicle for ‘time out’ of the business with their dog ‘Bertie’. They also hope it can promote Step 1 Travel and Excel’s workmanship at different shows they attend. Phil was particularly pleased with the availability of seats and the choice of material and colours from Excel. He has an interest in cycles and motorbikes and as such has a 16 place bike trailer to tow behind any one of the Sprinters. This trailer was previously used on rail related shuttle services he ran in Nottingham in 2013. Back then, the use of this carrier was believed to be a first for East Midland Trains. Ever since, the trailer has been somewhat redundant, but providing services to schools is an area he would like to get the trailer into. One of the proudest moments in Phil’s career was the delivery of his first coach. 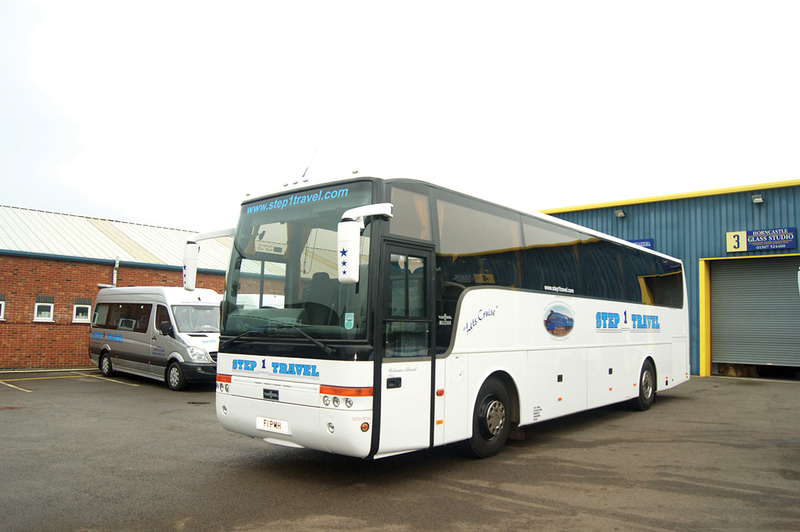 He operates Van Hool DAFs, as pictured here. 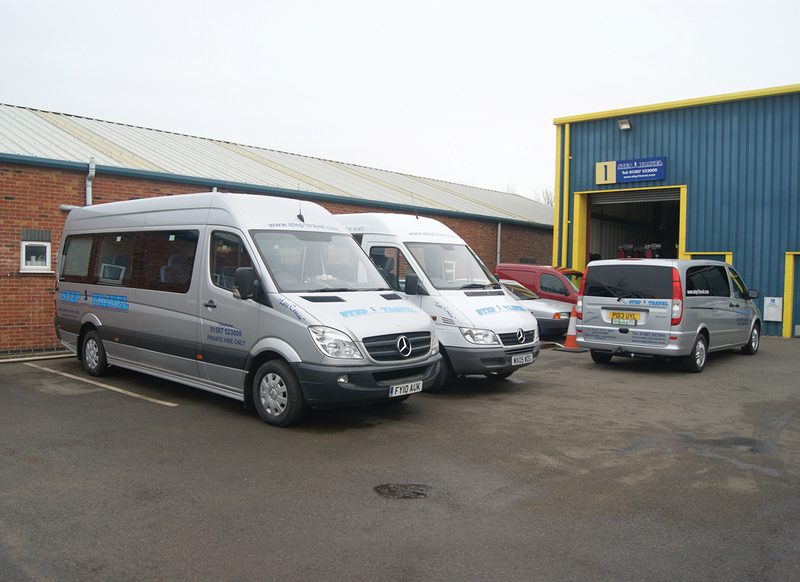 Two of its Mercedes-Benz Sprinter minibuses. The largest vehicles are the three coaches, all of them are Van Hools. Arriva Bus and Coach in Cleckheaton provided two of these from its used stock, whilst the other was bought second hand from The Kings Ferry. They are powered by DAF engines, which is a significant selling point for the operator. The reason why he prefers the DAF/Van Hool combination relates back to his time in the industry, having always liked the Belgian manufacturer’s bodywork and having often been told good things about DAF. In particular, he prefers the rear engine with luggage space in the middle. He also highly rates their accessibility around the engine bay. His time in the industry goes back to when he left school in 1986, he worked for Grayscroft Coaches helping out in the Mablethorpe based operator’s garage. To begin with he was involved with maintaining the company’s Fords and Bedfords, as well as a ‘couple of Leylands’. The two firms still get on well and work together today. He has driven for other firms, getting behind the wheel of various vehicle types including Mercedes-Benz, Setra, Plaxton, Volvo and a few Neoplans, He has worked in the coaching sector all of his career, apart from four years out of the industry. 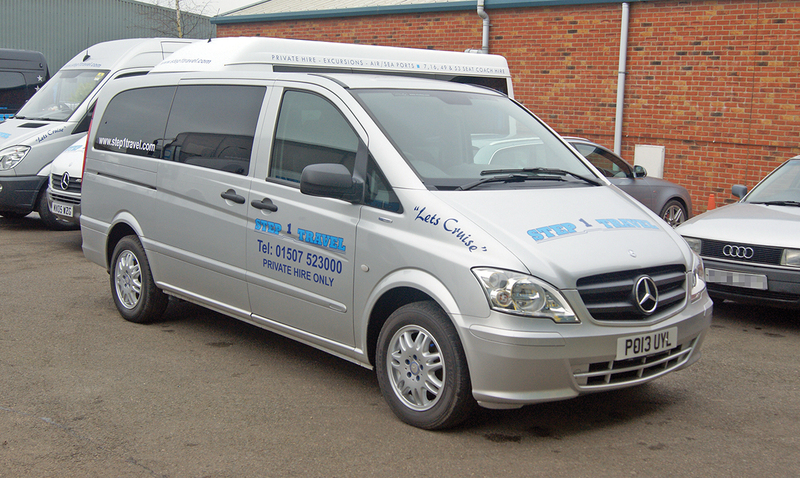 Phil started out on his own with Step 1 Travel in 2003, acquiring a single 16 seat Mercedes-Benz Sprinter minicoach. Prior to setting up, he was working for Wings of Sleaford, which in 2002 decided to call it a day. He said the operator gave its employees plenty of notice that it was to cease operating. Not long after the firm closed down, Phil took his National CPC qualification. With Applebys Coaches from the area also going out of business, he said there was a particular niche for coach holidays he thought his company could fill. This is particularly the case in Horncastle, where Step 1 Travel is the only coach operator. One of the operator’s Mercedes-Benz Vito eight-seaters. Another factor behind Phil setting up Step 1 Travel was the fact that when his mother retired, she began organising group travel events in Horncastle. He ended up driving on one of her tours and it became a regular occurrence. This lent him a database of customers he could start his business with. His mother still had an involvement up until her sad passing in 2010. Looking back on setting up the operation, Phil described it as a very busy time, having flown to Scotland and Ireland looking for vehicles to purchase. Although starting out small, the business naturally grew, with the aspiration to one day operate a full size coach. Having had some success with the smaller vehicles, he took the decision to go for his first Van Hool DAF in 2007. Reflecting on receiving his first coach, he said, ‘You look at the vehicle in your unit and you say to yourself: that’s yours, you own it, you operate it properly’. That was a proud moment for Phil, along with gaining his International Licence a few years later. As his fleet grew over the years, so did his staff. Denise, Phil’s partner came onboard with the business as a driver and has since become a major part of the team. She now does a lot of the administration work as well as getting behind the wheel. With Bertie, their Cocker Spaniel the operation has become a family business! 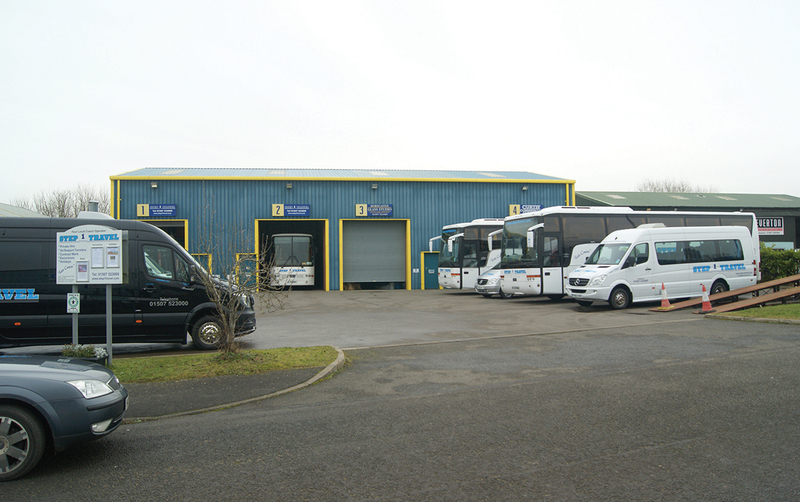 There has been a lot of change on the industrial estate where Step 1 Travel are based. His company was originally housed in a smaller unit next door to the current site. It moved to the larger facility it now inhabits in 2005, providing brand new buildings to home the fleet. Looking back on his time developing Step 1 Travel, Phil said, ‘In some respects, time goes by so fast when you’re busy and you don’t have time to reflect on it’. Helping him over the years is the fact he has worked from the ground up to management level. He started his career in the workshop at Grayscroft, which gave him mechanical and tyre knowledge. He then studied business in the early 90s and has gained experience in driving and running an operation throughout his time in the industry. This has all been beneficial to running his own company, having been ‘both sides of the fence’, both operating and driving. He said, ‘You don’t treat any of your staff like you wouldn’t want to be treated yourself. I’m the boss, but I will still sweep the floors. That’s what I started out doing, then I progressed to changing filters and tyres. You work your way up, and that’s the best way to start, from the bottom up’. An interesting feature on the coaches are murals reflecting local items and places of interest. From his own drivers, he likes to see an interest in buses and coaches, expecting them to look after the vehicles as if they are an ‘extension of yourself’. They must also be able to work with people, with a ‘pleasant personality’, not to mention the ability to drive to a higher standard. Honesty is something else he looks for in employees. It is difficult to get good drivers, he observes, but at the moment he said his situation is ‘good’ for these members of staff. Some have recently joined the operation, with one new starter having a coaching background and another having driven buses in London. One other driver they have taken on is completely new to the industry. Drivers, Phil said, were many years ago seen as ‘knights of the road’. However, he believes in recent times some people think it is an easy way of finding a job, making it lose some of its credibility. In particular, the attitude of school kids to not only the drivers but to the vehicles themselves ‘can leave a lot to be desired’. Poor attitude to his staff is one of the reasons he does not allow alcohol to be consumed onboard his coaches. On some occasions, his drivers have ‘taken flack’ for enforcing this. As well as Driver CPC, Phil has rolled out First Aid training for some of his employees. A few of his drivers have done NVQs. He has also taken on an apprentice, Olivia Brown, as part of an official apprenticeship scheme. She has now passed her D1 licence so can do school runs and private hire work. Step 1 Travel’s depot in Horncastle. Driving the growth of the operation, according to Phil, is the presentation of the vehicles. Marketing the business is the ‘hardest thing’, which for the company is largely achieved through word of mouth and its livery. He acknowledges the internet has taken over when it comes to publishing company details, but he also sees some of the older generation still not having access to the web. It is not just cleanliness of the roads that presents an issue with Phil, he also notes the state of disrepair some of them are in. He has found he has changed more vehicle components, such as ball joints and notices more tyre wear, saying, ‘you just have to avoid things like pot holes and verges’. Step 1 Travel is well equipped for carrying out their own repair work, recently having taken a set of Totalkare wireless column lifts. These are used to do almost all of the firm’s maintenance work in house and have been ‘absolutely brilliant’. As well as the state of the roads, what concerns Phil in the industry is that ‘driving and exercise do not go hand in hand’. In his own time, he teaches circuit training, so fitness is an issue close to his heart. He believes poor levels of fitness is a general problem across society rather than just in the PCV sector, but ‘driving doesn’t help’. He believes there is a call for improving fitness levels in this line of work, a course of action he said would also help boost motivation amongst staff. To help encourage fitness in workplaces, he suggests having activity days. For instance, instead of having a typical boozy Christmas work party, his team went ten pin bowling instead. He does observe though that regular medicals are de rigour for the industry. Another challenge is the coach parking in London. Phil says a good start to solve the problem would be to have North, South, East and West coach parks within or just outside the ‘central area’. He gave the example of Brewery Street coach park in Birmingham, which has 32 bays, drivers room with toilets and a controlled entry gate which he says is a good idea.